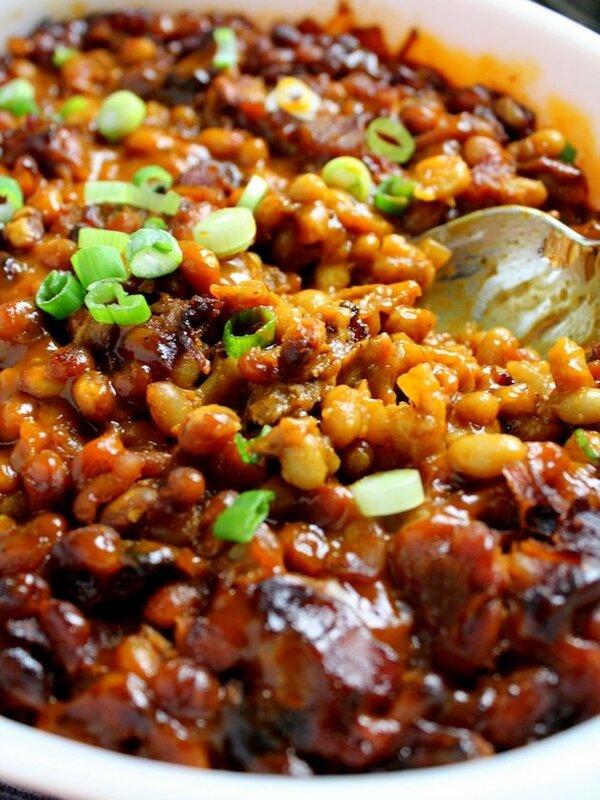 These “Secret Sauce” BBQ baked beans are a perfect balance of tangy, spicy and sweet. 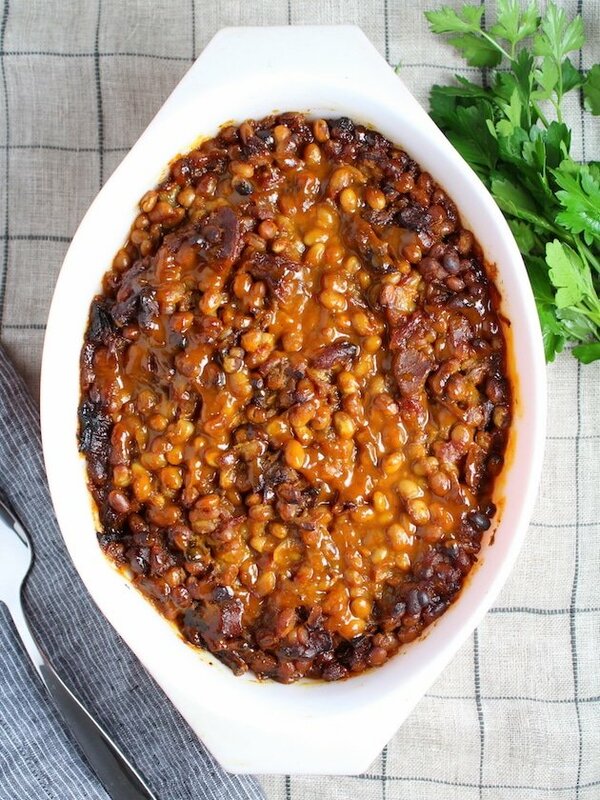 If I’m honest, I’ve never thoroughly enjoyed baked beans because I usually find them way too sweet. 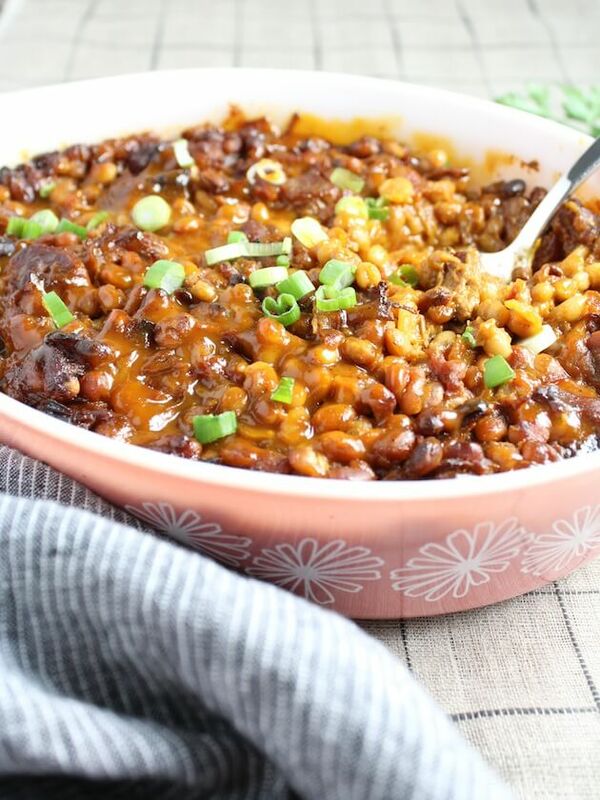 Maybe it’s because most BBQ sauces that you buy ready-made are predominantly sweet, and they are the main component used to make BBQ Baked beans. I was determined to come up with my own recipe that was finger-licking good. And Eureka! Here it is! Undoubtedly, the secret to these amazing BBQ Beans is in the sauce!✨ And I’m sure the addition of the bacon and pulled pork just elevates the sugary sweet tangy party going on in this BBQ Bowl 2016. This recipe is just begging to be made alongside its best friend Pulled Pork Sliders With Tangy Warm Cabbage Slaw. 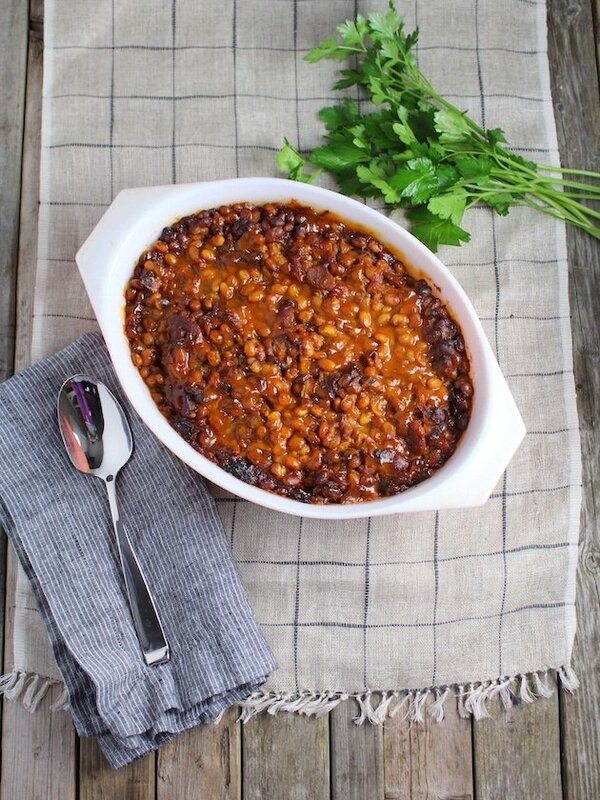 You actually use a cup of the pulled pork for the baked beans. See – BFF’s! This is truly the perfect meal to serve when you’re entertaining friends and family, watching football or having a summer cook out. 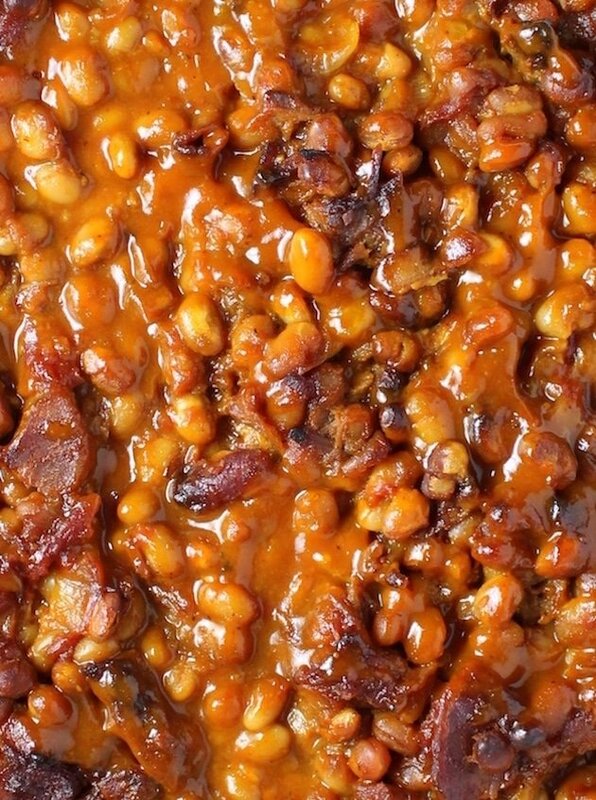 BBQ Baked Beans with perfect blend of mustard from the Carolinas, tomato & ketchup from Kansas, vinegar & molasses from Memphis, & heat from Texas! Preheat oven to 400° F. Place bacon on a cookie sheet lined with aluminum foil, then bake for 15 minutes. Remove bacon and place on paper towels to absorb bacon grease, and reduce oven to 325° F. Reserve at least 2 tablespoons of the bacon fat. Add 1 tablespoon of the rendered bacon fat and 1 tablespoon olive oil to a large saucepan and bring to medium heat. Add the mustard, vinegar, ketchup, brown sugar, garlic, salt, cayenne, and black pepper. Bring to a simmer until the sugar has dissolved, about 10 minutes and remove from the heat. While BBQ sauce is cooking, chop up the bacon. After the BBQ sauce has cooled remove the smashed garlic cloves from the sauce and discard. Add 1 Tablespoon olive oil and 1 tablespoon reserved bacon fat to an 8-quart Dutch Oven (or sauce pot) and bring to medium-high heat. Cook the onion, stirring, until soft, about 5 minutes. Sprinkle with salt and pepper, mix in the garlic and cook 1 more minute. Add the BBQ sauce, bacon, pulled pork, sugar, stock, molasses, a sprinkle of salt & pepper, beans and tomatoes; bring to a boil. Cover pot (or transfer to a baking dish) and place in oven; bake until thick and fragrant, about 2 hours. BBQ sauce recipe makes about 2¼ cups sauce total. You can skip the BBQ sauce recipe and replace it with your favorite store-bought brand. No rating; have not tried recipe yet. Other than making a pulled-pork recipe, where do I get 1/2 lb of pulled pork ? This sounds great for left-overs; saving just for that reason. Thanks for sharing, this is on my “to do” list. Hi John, many BBQ restaurants will sell this to you. 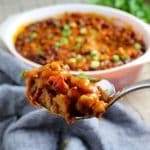 When we lived in Virginia i would go to a BBQ place and get pulled smoked chicken for my Smoky Chicken Chili all the time. Or you could call you local grocery store and see if they sell cooked pulled pork as a prepared food. I hope that helps. You know I love anything bbq!!! Have you tried using a crockpot with these instead of baking them? Hi Vanessa, I haven’t tried a crockpot with this recipe. I’m sure it would turn out great and be delicious! Is it 1 1/2 cups of beef stock or 5 1/2 cups? Hi John, You only need 11/2 cups of beef stock for this recipe. They’re dangerously delicious! I hope you enjoy them Christine! Thanks for stopping by! Thanks so much! I think you’ll love them!